WD-40 is an everyday product, useful in every household, workshop, garage and business premises in the country. But did you know its origins are based on fundamental scientific and engineering principles? WD-40’s unique formula was developed by engineers in California. They were looking for a way to displace water and prevent corrosion occurring on the shells of space rockets. It took this crack team of chemists 40 attempts to refine their water displacement formula, and it’s that same secret mixture that helps you lubricate squeaky door hinges today! 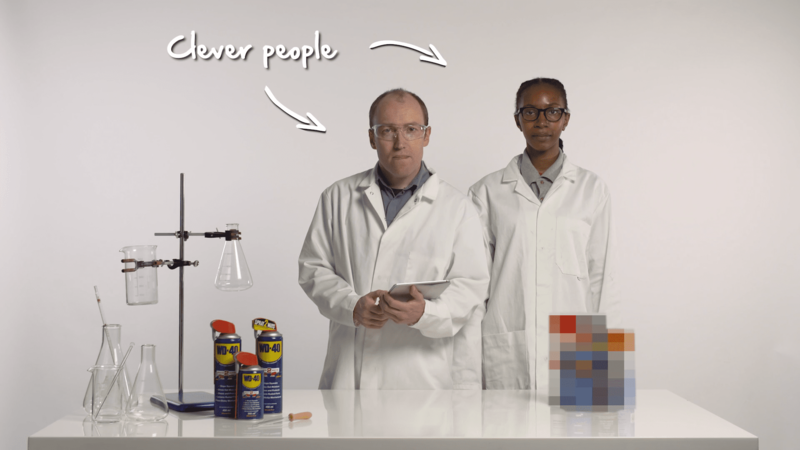 To highlight and celebrate the science behind WD-40’s Multi-Use Product, we’ve created a series of instructional, eye-opening and astonishing videos. Take a look and see how our secret formula stands up to scientific scrutiny, especially when pitted against competitor products. Tribology is the science of interacting surfaces in relative motion. It’s the study of the principles of friction, wear and lubrication, and is relevant in a vast field of applications. From engineering and industry, to car mechanics and molecular chemistry, even medicine. Tribology dictates how your car engine runs, how the lift operates in your building, how your electricity is generated. Even how your grandmother’s replacement hip works! Surface tension is an important factor in lubricant penetration. It dictates which fluid will win in a direct competition for space; important when you’re trying to displace moisture from joints, hinges, screws and other tight spaces to improve movement. WD-40 has a lower surface tension than a number of competitor products. 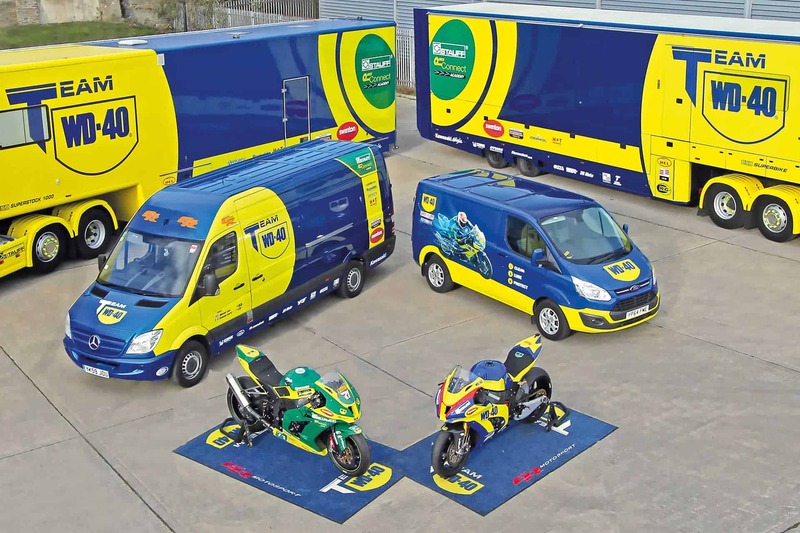 We placed a drop of WD-40’s Multi-Use Product next to a drop of competitor product on a flat sheet of metal, to show how WD-40 will push back against the competing liquid, forcing it out of the space rather than mixing with it. The outcome? Proof that WD-40 will penetrate faster and further than competitor products. WD-40 is literally named for its water displacement properties. WD-40 displaces water faster and further than any other competitor product. Thanks to its lower surface tension (see above), WD-40 can push water droplets away completely. This leaves tools, components and surfaces free of moisture that would otherwise cause corrosion and rust. As with the above experiment, when you factor in gravity, you’ll see that WD-40 pushes the water droplet further down the sheet metal than the competitor products. All of us have seen capillary action in real life, but probably don’t understand the force behind it. Ever thrown a straw into your drink, then panicked as the liquid rises up through it, threatening to spill out? That’s capillary action at work – the ability of liquid to flow in a narrow space without gravitational assistance. (Or even in opposition to it, as in the case of the straw.) WD-40’s low surface tension gives it great capillary action. This means you can be sure it will penetrate the tightest spaces, even creeping upwards in defiance of gravity to reach tiny cracks and gaps. Watch WD-40’s capillary action in our video – our experiment shows its ability to spread on a flat surface. It outperforms the surrounding brands by double the area covered, in the same amount of time. WD-40 is probably lesser-known for its dielectric strength. But we can quickly and easily explain with our fun little helicopter video! Dielectric strength is the ability of a material, be it solid, liquid or gas, to conduct electricity. WD-40 can work in a two-fold approach to improving electrical contact. First by displacing the water that initially disrupts the contact, then second, by protecting and improving the electrical contact once restored. It does this by creating a barrier which stops further water ingress. Our little RC ‘copter experiment was conducted under laboratory conditions, so we don’t advise people to copy it. Just enjoy it for what it is! WD-40’s dielectric strength can also be appreciated in our ‘flammability’ video. It shows the non-flammable properties of WD-40 against a competitor who uses LPG propellant. WD-40 displaces the water, interrupting the electrical contact of our spark plug test rig. This protects the contact points against moisture, allowing them to operate again. Your eyebrows won’t be removed in the process either – another handy feature! WD-40 has an excellent working temperature range, suitable for use in environments between -50°C and +150°C. Part of this is down to our chosen propellant. We need to use a propellant to enable our formula to spray forcefully from the straw or nozzle. We use CO2 as the propellant in all our cans, as it doesn’t negatively impact the working conditions of our product. Alternatives such as LPG (liquid petroleum gas or Butane) cause a severe drop in temperature as they force the product out under pressure, and are highly flammable therefore minimising the window of operation. As shown in our ml fill video, CO2 is a gas propellant. It takes up far less can space than a liquid or mixed propellant such as LPG. This means that the ml size stated on the can is what you will actually get out in usable volume. 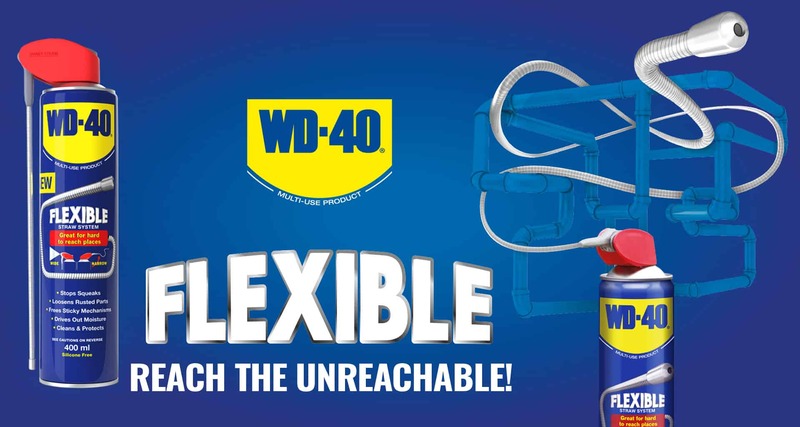 So a 400ml can of WD-40 will deliver 400ml of liquid formula to keep you working harder for longer. Our tricky triggers video is a nod to our engineering heritage as much as anything. WD-40 has been synonymous with two things in its history – the blue and yellow can, and the little red straw. Our red straws provide precise and direct application in hard to reach places. They allow users to target very specific areas such as inside screws, holes and cracks. However, as they detach for storage and access of the wide spray nozzle, they are very easy to lose. Whole generations will be able to sympathise with that desperate search for the little red straw at the bottom of the toolbox. We’ve overcome this design flaw with our Smart Straw delivery system. Our dual function nozzle still allows both wide and narrow spray application, but via a fixed delivery system. The little red straw is now a part of a unique hinged nozzle, meaning it can be flipped up into position for precise use, and flicked down again when you’re done or for wider application. And as it’s fixed in, you can apply more pressure to the straw when bending it round objects as it won’t flick out of position as before. Best of all – you can’t ever lose it! As useful as WD-40 is, and as much as we take it for granted, it’s fascinating to see the science behind our secret formula at work. So next time you reach for a can of WD-40, you can bust out the smug science knowledge to anyone within earshot! Win-win! Remember, we conducted these experiments in safe laboratory conditions. Please don’t attempt to recreate them at home. Find out more about our Multi-Use Product and Where to buy it.